Score touchdowns on any snack table your next game day with this Bacon-Jalapeño Cheesy Football. Keebler®, Town House® and Club® are registered trademarks of the Kellogg Sales Company. ©2015 Kellogg NA Co. Beat first 3 ingredients with mixer until blended. Transfer to work surface; shape with hands to resemble football. Pour bacon bits into pie plate; spread to form even layer. Place cream cheese football, upside down, in pie plate; turn to evenly cover top and sides of football with bacon. Transfer to serving plate. Press any remaining bacon bits from pie plate into cream cheese mixture until completely coated. Cut provolone cheese into thin strips; use to decorate football as shown in photo. Serve with crackers. 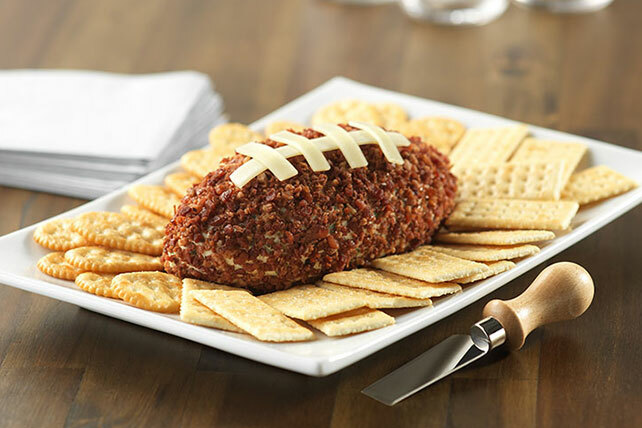 For convenience, this fun cheese ball can be prepared ahead of time. Refrigerate up to 24 hours before serving. As a bonus, this refrigerating time will also help develop the flavor of the cheese ball.